Besides big brands, some regular users have amassed a large following. Recently, a trio of YouTube content creators interviewed President Barack Obama on his policy goals. Overall, the video-sharing firm says that 100 hours of video are uploaded to YouTube every minute. 1About three-in-ten online adults (31%) posted a video to a website in 2013, up from 14% in 2009, according to a 2013 Pew Research Center report. Among those who posted a video in 2013, 35% said they did so in hopes that it would be widely viewed or “go viral.” Overall, 72% of online adults use video-sharing sites like YouTube or Vimeo – a figure that more than doubled between 2006 and 2013. 2Animals – especially cats – are popular subjects of videos to post online, as are everyday people and events. Among internet users who posted an original video online in 2013, 45% uploaded their own video of a pet or animal. Some 58% posted a video showing friends and family doing everyday things. Another 56% posted a video of themselves or others doing funny things, while 54% posted a video of an event they attended. But fewer internet users post tutorial videos (30%) or intentionally staged or scripted videos (23%). 3YouTube is the second-largest social networking site, behind Facebook. A 2014 Pew Research Center study of online adults found that three-quarters (77%) of internet users are on Facebook, while 63% use YouTube. Although YouTube has a smaller reach than Facebook, it is more widely used than LinkedIn (25%), Google Plus (24%) and Twitter (21%). 4YouTube is most popular among younger adults, blacks and Hispanics. Like many social networking sites, YouTube is widely used by younger users – 82% of 18- to 29-year-olds used YouTube in 2014, compared with 34% of those 65 and older. Racial and ethnic differences also exist – blacks (76%) and Hispanics (74%) are more likely than whites (57%) to use the video-sharing site. 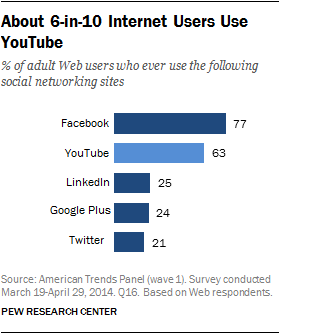 5Citizens are increasingly using YouTube and other social networking sites to share news-related videos. Twelve percent of social media users have posted their own video of a news event to a social networking site, according to a Pew Research survey from 2014. In addition, from January 2011 to March 2012, Pew Research examined hundreds of the most popular news videos on YouTube and found that close to 40% were produced by non-journalists. Many of these videos chronicled natural disasters or political unrest, like the Japanese tsunami or the Arab Spring protests.